LONDON, GREATER LONDON, UK, October 25, 2018 /EINPresswire.com/ -- The 3D printer sector is now achieving vigorous global growth across the aerospace, automotive, energy, general industrial, health and even the jewelry end-user industries, 3D Printing Devices, Services And Supplies Global Market Opportunities And Strategies To 2022, an exciting new report, from The Business Research Company, shows. Healthcare is the largest end-user industry, according to 3D printer sales figures, while the energy end-user market is growing fastest after a slow start. 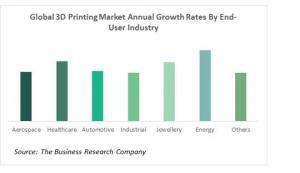 3D printer market growth is, however, over 20% year on year across all the end-user segments. 3D printing or additive manufacturing (AM) builds a three-dimensional object from a computer-aided design (CAD) model or AMF file, usually by successively adding material layer by layer. The range of materials that are currently being used in 3D printing includes plastics, porcelain, ceramics, stainless steel, carbon, graphene, titanium and other metals. This list is not exhaustive; new variations on materials or alloys are made every day. The advantages of this technology include the possibility of mass customization of products, short lead time and high speed of development, supply chain simplification, waste reduction and the fact that just-in-time inventory can be easily managed and created. 3D printing trends include technological developments in 3D printing as well as growing government and private funding to take advantage of 3D printing market potential. For example, in healthcare the growing demand for organ transplantation and ease of development of customized medical products by 3D printing offers expanded 3d printing market potential and so new growth opportunities for the companies operating in this market. 3D Printing Devices, Services And Supplies Global Market Opportunities And Strategies To 2022 is one of a new series of reports from The Business Research Company that provide a market overview, analysis and forecasts of market size and industry statistics, market growth rates, market trends, market drivers, market restraints, market revenues, market shares and company profiles of the leading competitors in over 300 industry reports, covering over 2400 market segments and 56 geographies. The industry reports draw on 150,000 datasets. Extensive secondary research is augmented with exclusive insights and quotations from industry leaders obtained through interviews. Market analysis and forecasts are provided by a highly experienced and expert team of analysts and modelers. Markets Covered: 3D Printing Hardware Devices Market, 3D Printing Software Market, 3D Printing Services Market, 3D Printing Materials Market. Data Segmentations: 3D Printing global and regional total and by product segments – hardware, software, services and materials 2014-22, market size and growth rates. 3D Printing Organizations Covered: 3D Systems Corporation, Arcam AB, The ExOne Company, Stratasys Ltd., EOS GmbH Electro Optical Systems, EnvisionTEC, Materialise NV, XYZprinting, SLM Solutions Group AG, M3D. Time Series: 2014-16 actuals, 2017 estimates, 2018-22 forecasts. Other Information And Analyses: Processes involved in 3D printing, global 3D printer sales, market drivers, market challenges, market opportunities, company overview, business strategy, financial overview, products and services, SWOT analysis, recent developments, key executives for ten leading 3D technology companies. Strategies For Participants In The 3D Printing Industry: The report explains over 30 strategies for 3d printing sector companies, based on industry trends and company analysis. These include increasing the efficiency of machines to expand the addressable market, a focus on customer training and education to promote awareness, and technological developments such as 3D systems’ Jaw in a Day, the latest addition to its VSP (Virtual Surgical Planning) Reconstruction product line. Opportunities For 3D Printing Sector Companies: The report reveals the global, regional and country subsegments where the 3d printing industry will put on most $ sales up to 2022.